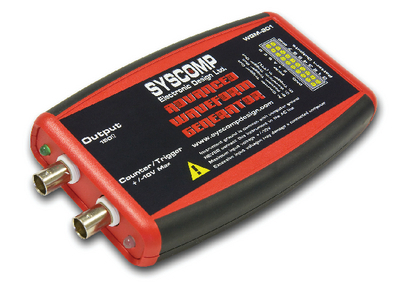 With six signal generators in one small, USB-powered package, this generator does not require an AC adaptor. Simply plug in the unit to an available USB port, install the included open source software, and start generating analog and digital signals. The 8-bit pattern generator features a frequency and event counter with adjustable trigger level, two independent pulse channels with adjustable duty cycle and frequency, triggered and tone burst output modes , plus a noise generator. Independent offset and amplitude controls are provided for waveforms up to ±10V. Sampling Rate: 130MS/s DDS. Output frequency range: 0.1 Hz–10 MHz for sine waveforms and 0.1 Hz–3 MHz for all others including arbitrary waveforms. Open source software runs on Windows, Linux and Mac.